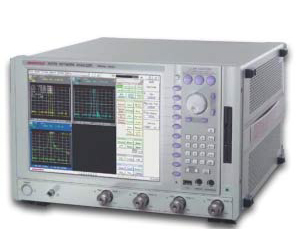 The R3768/3770 Network Analyzer is a high-performance multi-port analyzer designed with a greater emphasis on measuring passive components. Higher frequencies are also supported, with the R3768 supporting frequencies from 300 kHz to 8 GHz and the R3770 supporting frequencies from 300 kHz to 20 GHz. All models have the software fixture function that perform real-time simulation of virtual matching circuits and standardized impedance conversion in addition to S-parameter analysis. At a high-speed sweep of 5 µs/point, simulations of even complex analysis are accomplished instantly. Moreover, multi-port models can perform software balun simulations and balance parameter analysis. If these models are combined and used with the flexible multi-window and multi-trace functions, they can also measure complex analysis items instantly. The large high-visibility display is a key factor in improving the analysis efficiency because it enables the simultaneous display of multiport paths in addition to the simultaneous display of fixture simulation traces.